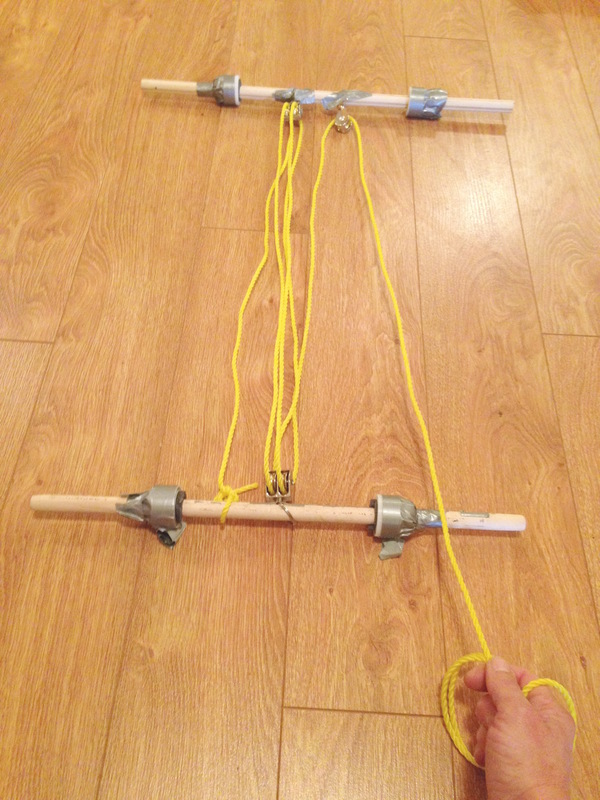 Thread rope through pulleys on two rods, for students to feel how the force changes with different numbers of pulleys in the system. Before the lesson, make small grooves in the wood where they pulleys will be placed, to fit the metal rings. See photos. Add a metal ring to each pulley, then slide onto the rod - one double pulley on one side, and a double and single pulley on the other. Fit the ring into the grooves, then duct tape over the ring and groove to hold the ring in place. Tie one end of the rope to the rod with the one double pulley. Ask two students to face each other and hold the rods in front of them. Feed the rope from its tied-off end through the double pulley on the other rod. Hand the end to a third student to the side of the first rod where the rope started. Ask them to try and pull the students holding the rods together. It will be hard, or impossible, depending on their relative strengths, as the same force is needed as the force pulling back - the pulley has only changed the direction of the force. Feed the rope back and forth between the rods, threading it through a pulley each time. There will now be 5 or 6 rope lengths pulling on one of the rods. 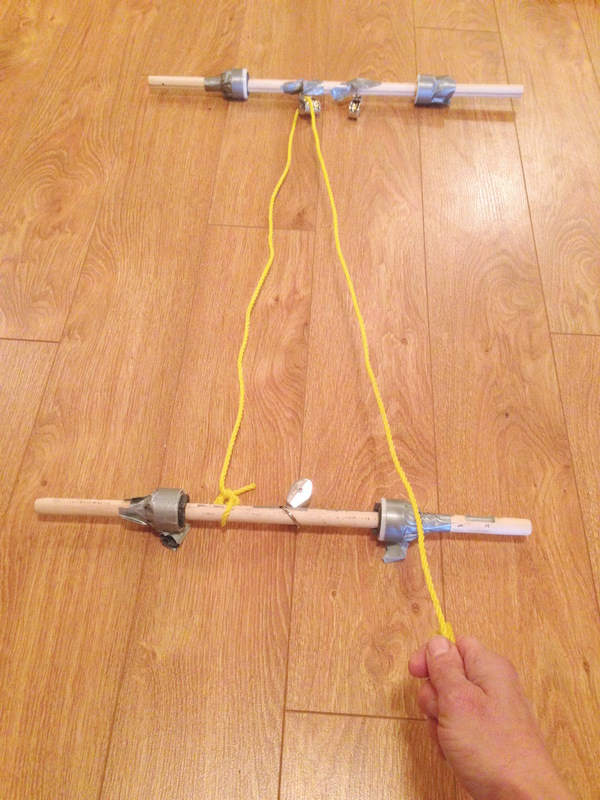 Ask the same student to pull the rods together, and to compare how much force it takes - it should be much easier. They will need 1/5 or 1/6 of the force than previously, as the force is shared between all the rope lengths. In exchange for this decrease in force required, they will have to pull 5 or 6 times as much rope through the pulleys. The power of this simple machine is demonstrated in the fact that my strong 1/2" dowel was broken with first use. Need to use thicker dowels, or ones made of a stronger material (which can also have grooves cut in it).